Every Saturday, I host a feature called Kid Konnection -- a regular weekend feature about anything related to children's books. This week, I'm going to share with you a cute middle grade read with some important messages. Summary: I did a mean thing. Over the past few years, I've found that I really enjoy Julie Sternberg's middle grade novels. Her first novel about Eleanor and her adventures was called LIKE PICKLE JUICE ON A COOKIE, and the second book which chronicled Eleanor's trip to camp was titled LIKE BUG JUICE ON A BURGER -- you can read my reviews here and here. Well, Eleanor is back in LIKE CARROT JUICE ON A CUPCAKE, and this time she learns a thing or two about friendship. In LIKE CARROT JUICE ON A CUPCAKE, Eleanor discovers that her friendship with best friend Pearl is being tested when a new girl transfers to school. Eleanor is eager about developing a new friendship with the girl; however, when Pearl is assigned to be her buddy, Eleanor feels like Pearl wants to be with the new girl more than Eleanor. To make things even more complicated, Eleanor is the lead in the school musical -- which requires a solo! -- and she's terrified of performing in front of people. Fans of this series will definitely be glad that Eleanor is back with more interesting adventures. Eleanor is a delightful character and I love seeing her grow up through this series. Each and every book shows Eleanor facing a different challenge, and they also show how she deals with these obstacles while learning some valuable lessons along the way. Eleanor is a really funny character; and her storytelling abilities and insights into life are quite entertaining. The book is written in Eleanor's first person narrative, and I just think her voice is terrific. She's such a realistic young girl -- and totally honest -- and you can't help but love her as she navigates her way through friendship problems and self-confidence issues. As a mom, I adore these books! Not only do I love Eleanor, but I like how these stories show Eleanor in realistic situations. What kid doesn't experience grief, loneliness, homesickness, friendship woes, and insecurities? I think young readers will definitely be able to relate to Eleanor, and I hope they can incorporate what Eleanor learned about her life in their own daily situations. I'd be remiss if I didn't mention how cute the illustrations by Matthew Cordell are. They are many of his adorable pencil drawings scattered throughout the book. Not only are they entertaining in their own right, but they help break up the text for younger (and more reluctant) readers. In addition, the text of the book is written in verse which means less words per page! I think LIKE CARROT JUICE ON A CUPCAKE and all of the books in this series are wonderful books which help early readers to transition to chapter books. 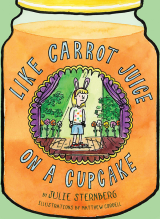 Once again, Julie Sternberg has written a winner in LIKE CARROT JUICE ON A CUPCAKE! Parents and kids alike are sure to love this very fun book that's part of a fantastic series! Highly recommended. I haven't heard of this series before. It sounds great - thanks for sharing your review! This is new to me too. Adding it to the list. I will have to mark this book for our daughter to read! I too am new to this series. Thanks for sharing it! I just got this series this week and can't wait to dig into the books!